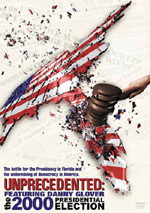 Season 2 takes place over a five-day period leading up to Election Day 2012, and encompasses numerous flashbacks to earlier events from 2011 and 2012. One of the season's major story arcs involves a wrongful-termination lawsuit made by a staff member alleged to have doctored a report about a suspicious U.S. drone strike. As details about the suit's origin and aftermath emerge, The Newsroom team continues its quixotic mission to "do the news well" in the face of corporate and commercial obstacles, and their personal entanglements. With this package, we find Season Two of the HBO program The Newsroom. 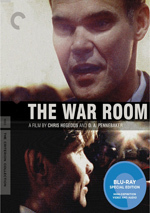 As occurred with Season One, this concentrates on the people and events within a fictional TV news studio. The Blu-ray set spreads all of Season Two’s nine episodes across two discs. The plot synopses come straight from the Blu-ray menus. 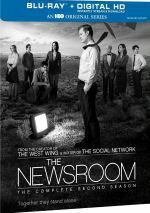 Season One of The Newsroom took on events of 2010-2011, and Season Two goes for 2011-2012; as seen here, it starts in August 2011 and will finish in November 2012. The manner in which it touches on fairly recent events gives it a little perspective; there’s not much distance but we find enough to ensure that the opinions aren’t wholly reactionary. Though they’re not exactly told in a neutral manner, as the series tends to wear its opinions on its sleeve. It also likes to speechify a whole bunch and to throw out dialogue that no human would ever actually speak. One’s enjoyment of Newsroom will depend on your tolerance for those trends. I fluctuate, as I can enjoy the show’s artificial dialogue but also find it to be off-putting, and the same goes for its attitudes toward politics/news. “Lawyers” accentuates the series’ strengths and weaknesses, though the episode mostly stays on the right side of that ledger. It flounders when it deals with Occupy, as it seems more invested in echoing that movement’s goals than anything else, but it provides better insight when it deals with other areas. These add to an erratic but mostly solid launch to the season. For me, Newsroom works best when it avoids moralizing and/or the personal lives of its characters and concentrates on the news operation. “Tip” mixes those various issues in a fairly satisfying manner, though it tends more toward the soap opera side than I might like. Still, it percolates in a mostly good manner and sets up various subjects well. Expect another semi-mixed bag from “Pete”. 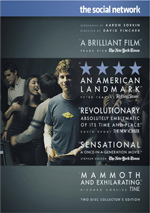 It launches on a rough note via one of its patented moral tirades, but it rebounds after that – mostly. I don’t think there’ll ever be a truly consistent episode of Newsroom, as it usually finds a way to shoot itself in the foot, but “Pete” still manages to develop various threads in a compelling manner – once it gets past that opening and some other politically heavy-handed bits. Though the show may come with the title “Unintended Consequences”, the episode follows fairly predictable paths. That’s especially in true in the case of Jim’s story, but it occurs elsewhere as well. These issues don’t make “Consequences” a bad show, but it seems a little lackluster. With this show, the series jumps forward quite a few months, which makes it jarring, as the program doesn’t handle the shift in the smoothest manner. This means that the show doesn’t flow quite as well as I might like; it develops some issues but feels a bit out of left field. The Genoa narrative gets a good push here, as do a variety of character areas. Of course, some of the usual editorializing comes along for the ride; it’s hard to find an episode of Newsroom that doesn’t follow that path. Even with those moments, “Step” moves along the season well. After seeing Genoa as a continuing backdrop all season, that thread leaps to the fore in the involving “Team”. The program digs into the issues in a satisfying manner and brings us up to date well. The show leaves me eager to see what happens to finish off the season – the only negative comes from the possibility that the excellent Marcia Gay Harden will no longer appear once the legal case gets resolved. When I encounter two-part episodes, I save my comments for the finale. The season ends on a positive note with the exciting two-part episode. It gives us some good revelations and concludes the year’s narrative arc in a satisfying manner. Though my review of Season One was mostly positive, I admit I came into Season Two with some trepidation, as I remembered the series’ preachiness more than anything else. S2 comes with some of that but seems better balanced and less strident. While it still flounders at times, S2 demonstrates a more mature, involving and enjoyable Newsroom. “First Thing We Do, Let’s Kill All the Lawyers”: creator/executive producer Aaron Sorkin, executive producer/director Alan Poul and actors Jeff Daniels and Sam Waterston. “News Night with Will McAvoy”: Daniels, Poul and actor Emily Mortimer. “Red Team III”: Mortimer, Poul, director Anthony Hemingway and actors Thomas Sadoski and Hamish Linklater. “Election Night, Part II”: Sorkin, Daniels, Poul and actors Constance Ziimmer and Olivia Munn. During the conversations, we hear about story/character subjects and themes, cast and performances, camerawork and editing, sets and locations, and other aspects of the series. If you heard the commentaries for Season One, you’ll know what to expect here. The chats come with decent morsels of information but they never become especially insightful. Though they remain worth a listen, they don’t add a ton to our understanding of the series. Next we find two Deleted Scenes. These accompany “First Thing We Do, Let’s Kill All the Lawyers” (2:16) and “Election Night, Part II” (1:09). “Lawyers” focuses on the fantasy football draft and some character issues, while “Night” shows a bit more election coverage. Neither adds a whole lot. We find Inside the Episode featurettes for all the season’s episodes: “First Thing…” (2:37), “The Genoa Tip” (3:13), “Willie Pete” (2:22), “Unintended Consequences” (2:21), “News Night with Will McAvoy” (2:51), “One Step Too Many” (1:59), “Red Team III” (), “Election Night Part I” (2:11) and “Election Night Part II” (4:49). Across these, Sorkin discusses various character/story elements and other aspects of the shows. These act as sort of an expansion of the commentaries, and they throw in some good thoughts, though they do tend to act as recaps more than anything else. While I liked much of the series’ first season, I thought The Newsroom had enough problems to make me less than excited about Season Two. Happily, the show offers clear improvements in its second term; the negatives still appear, but not to the same degree, so S2 works well overall. The Blu-ray comes with very good picture, more than acceptable audio and a handful of supplements. Season Two probably won’t convert those who didn’t live Season One, but I think it shows growth and becomes a compelling package of shows.